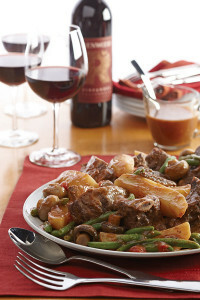 Tag Archive | "comfort food"
Keep warm with hearty dishes that satisfy appetites and comfort food cravings. From russets to reds, fingerlings to purples, the hearty potato comes in many beautiful varieties that add color and texture to beloved comfort dishes. 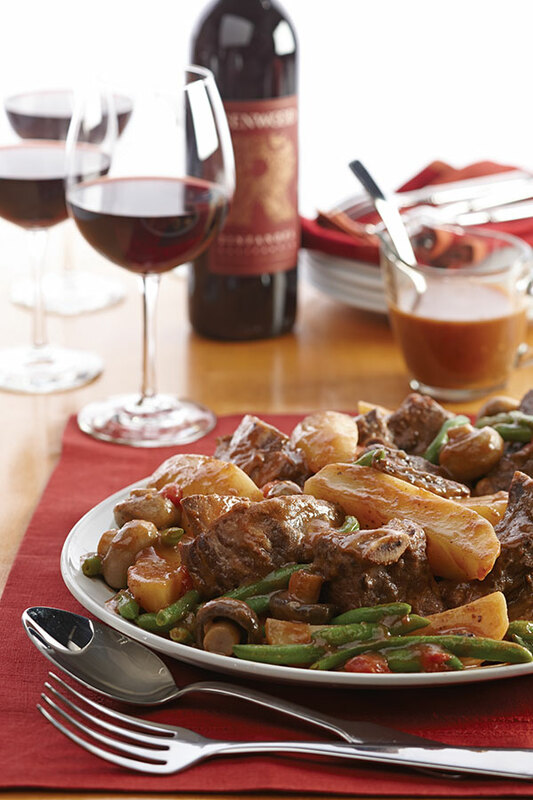 Bring out the flavors of your down-home creation by pairing it with a perfectly suited wine. • Potassium — Potatoes are a great source of potassium, which may help lower high blood pressure, making them a heart-healthy choice. In fact, potatoes contain more potassium than a banana or spinach. • Vitamins — A spud a day may keep the cold germs away. One medium-sized spud has nearly half the recommended daily value of vitamin C and is also a good source of vitamin B6. • Dietary fiber — Potatoes are also a source of dietary fiber, a complex carbohydrate, which is known to increase satiety and help with weight loss. • Gluten free — Potatoes are a naturally gluten-free food, so those with gluten sensitivity can enjoy this flavorful vegetable. 1. Dredge ribs in flour to coat; reserve leftover flour. 2. Heat oil in 8-quart Dutch oven on moderate heat. 3. Add half of ribs and brown on all sides. Once browned, remove ribs. Repeat instructions for remaining ribs. 4. Stir in the reserved flour. While stirring, add 1 cup water and wine and stir until thickened. 5. Return ribs to the pan. 6. Add onion, garlic, salt, pepper and bouillon and bring to a boil. 7. Cover and lower heat to simmer for about 1 hour, or until ribs are tender. 8. Remove ribs with slotted spoon and cover with foil to keep warm. 9. Add potatoes, mushrooms and beans. Simmer 20 to 30 minutes, or until vegetables are tender. 10. Add ribs and tomatoes with liquid, and heat through. 11. Use slotted spoon to remove meat and vegetables to large serving platter. 12. Remove gravy to serving container and serve with ribs. 1. Remove sausage from casing and crumble into medium skillet with onion. 2. Cook for 10 minutes or until both are browned, breaking up sausage with back of spoon. 3. Stir together ricotta, basil, garlic powder and egg white in small bowl. 4. Spread 1/2 cup marinara sauce in bottom of 9-inch square baking dish. 5. Place 1/3 of the potatoes in the bottom of the dish, forming solid layer with no gaps. 6. Drop 1/2 ricotta mixture in spoonfuls over top and spread out just a little. 7. Sprinkle with 1/3 of mozzarella and 1/2 sausage mixture. 8. Add 1/2 cup more sauce then repeat potato, cheese and meat layers. 9. 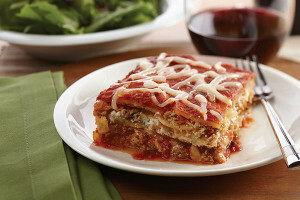 Top with last layer of potatoes, remaining sauce and mozzarella. 10. Cover with plastic wrap and make small slit to vent. 11. Microwave on high for 30 minutes or until potatoes are tender. 1. Combine Herbs de Provence, garlic salt, and pepper on a dinner plate. 2. Spoon flour onto a second dinner plate. 3. Coat each chicken breast with herb mixture; then dredge in flour. 4. Heat oil in a large skillet. 5. Add chicken and cook over medium-high heat until chicken is golden brown on both sides (approximately 3 to 4 minutes per side). If necessary, cook chicken in two batches so as not to crowd the pan. 6. 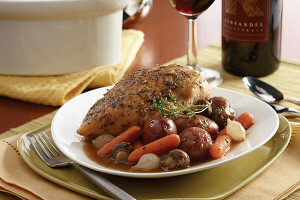 Once browned, place chicken in large slow cooker and add all remaining ingredients, except fresh thyme. 7. Cover slow cooker and cook on high for 4 hours or on low for 8 hours. 8. Sprinkle with fresh thyme before serving, if desired.